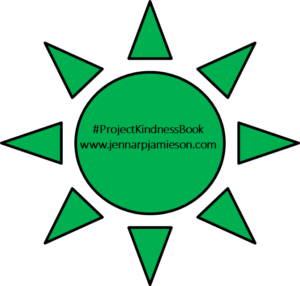 Jenna Jamieson, Author – read. connect. give back. People change lives. Everyday this happens, a person changes someone else’s life. That’s quite a bit of power to be able to literally change someone’s life. That’s actually incredible if you truly think about that. Strangers, doctors, retail associates, food servers, teachers, police officers, managers, etc. They all have the power to change someone’s life in such a positive and meaningful way. Any person can change a life and I have had many that have changed mine recently. First and foremost, I am mostly positive, not always, but mostly. I like to believe that people do good and deep down are good. I hope to leave my house each day knowing that there are going to be people that I have the ability to impact in a great way. While I hope to have that impact, there are also so many people that change mine (probably without even realizing it!). I like to think about how the small things people are doing are changing my life in a pretty cool way. This first group of people that has regularly and frequently been changing my life are the Lowe’s employees. They always seem to make me smile even if it’s the second or third time I’ve been in my local Lowe’s store. They add smiles and humor to my life. From the carpet guy to the countertop lady, to the guy in doors yesterday who said to us in a joking way, “Aren’t you done renovating yet?…” , our trips to Lowe’s have become an adventure. Nearly every employee knows us when they see us coming, many ask about the progress on our house, if we are finished painting, requesting to see pictures, or just saying something like, “You’re back again” or “I think I’ve seen you every day this week”. While it might seem crazy, it seems like their humor and smiles makes us feel like family. Lowe’s might seem odd, but it’s renovation time and that means life is crazy! I must find the small things in life and their impact is helping me get through the chaos! As for the others, I met two phenomenal people that just happened to impact my life. Both inspired me and motivated me. The first, an amazingly successful person that owns a business in California. He’s gone through many different phases in life and has had many different adventures, many of which I was a bit envious of, but mostly because they aligned with goals I hope to achieve at one point in my life. Generally, he’s lived abroad and I dream of doing that, he has the ability to give back in a very large capacity and I hope to do that more and more, and he’s got a calm and pleasant demeanor that makes him admirable in his role as a business owner (I hope to become more calm with each school year!). Generally, we meet a lot of people, but this was a person that I felt like really appreciates giving back and that’s of course something I can get behind! As someone that would love to continue to expand my backpack drive, even possibly forming it into a non-profit, it was cool to hear that he has a passion and heart for giving back, too. As a side note, I met him at a presentation he gave to my early bird class and he later inspired a story that my afternoon classes wrote together. We created a “class story” together and it started with, “One day Mrs. Jamieson’s class went on an adventure to California to open a computer technology company…”. It was cool to see the class use their imagination based on a speaker that impacted my life. Finally, a speaker for my early bird class came and shared a life-changing story that was beyond inspirational. The story he shared about his cousin who died of cancer was heartbreaking yet motivational. He used that sadness and turned it into a way to change the lives of others. The way he has used his cousin’s death to help others with cancer through exercise is one of the coolest, selfless, and inspiring acts that I have heard. The amazing things that his program, Strong Survivors, is doing for cancer patients to improve their lives has made a lasting impact on my life. It really gives me more perspective on why I think life is about helping other people. With all of that, these people have not only impacted my life, they have helped me, motivated me, and inspired me. They have made me laugh, smile, and reaffirm why helping people is what life is all about. It gives you purpose and that will give more to you in life than money ever will. 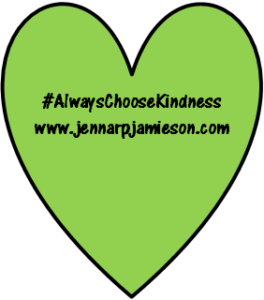 Keep on smiling, giving, helping others, and #AlwaysChooseKindness! 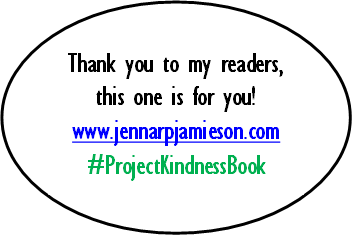 It’s been a great month because kindness is floating around everywhere. 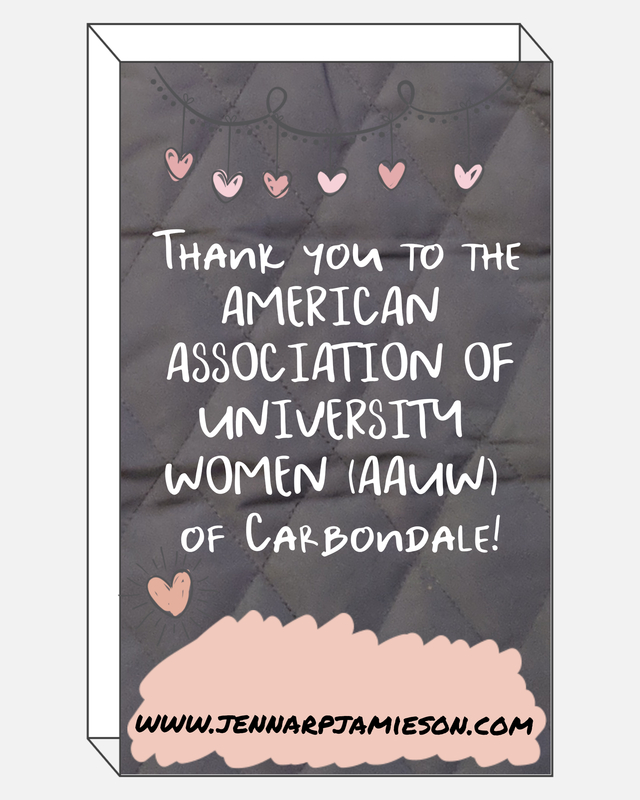 From kindness days at my high school to the amazing night I had when I went to speak to the American Association of University Women (AAUW) group in Carbondale. It was such a pleasure to meet and interact with such a lovely group of women who are dedicated to making their community and the world a better place for others. I felt honored to be invited to speak to them about my Backpacks for Success project and my passion for giving back and helping others. Backpacks for Success is a community project that I started so that I could give back to students that cannot afford backpacks and basic school supplies. This is the third year I’ve coordinated it and each year it seems to get bigger and bigger. This group was phenomenal to speak with because they do so many amazing things in the community. In fact, one of the coolest parts that I learned that evening is I actually had the grandson of the women who invited me to speak in my one of my classes at the high school. Small world! 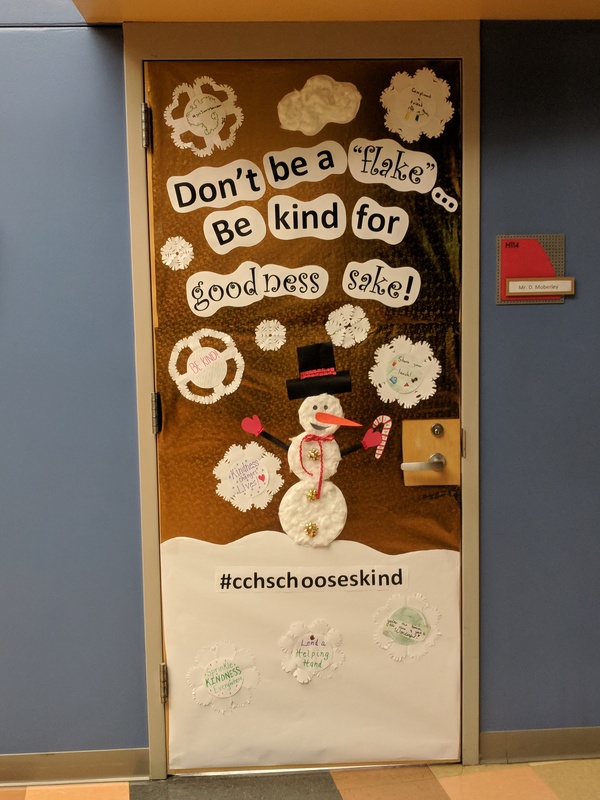 Lastly, kindness days at the high school were fun, but the best thing about it is the door that my mom helped me create to correlate with our kindness message. We created a door that emphasized what I think it important – sprinkling and spreading kindness everyday to as many people as possible. 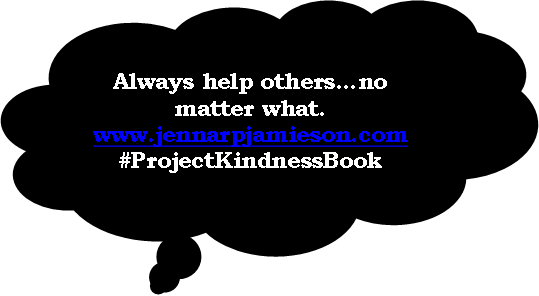 Help make the world better by doing one random act of kindness at a time. 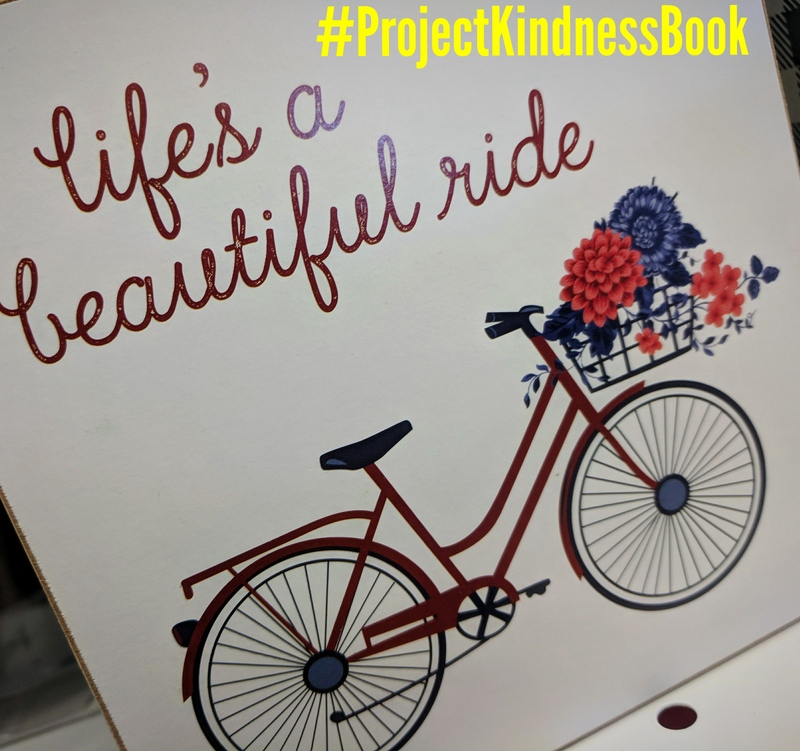 Happy 2019 – may you embark on my #ProjectKindnessBook challenge and spread more kindness where you live! Over Thanksgiving break, my husband and I were driving in the car and I said to him, “I really miss my students. I hope they are enjoying their break, but I’ll be happy to see them again.” Thanksgiving is a time when we often emphasize how thankful we are for our friends and families, but I also want to emphasize how thankful I am for my students. After all, these students change my life on a daily basis – teaching me as much about life as I teach them. Teaching is also what got me out of my 3+ years of random and chaotic employment. I was thankful for that time and the lessons that it afforded me, but I am even more thankful of the purpose that teaching and my students give me. I recently hosted my giving back and kindness lesson in class. It’s my absolute favorite lesson to teach. 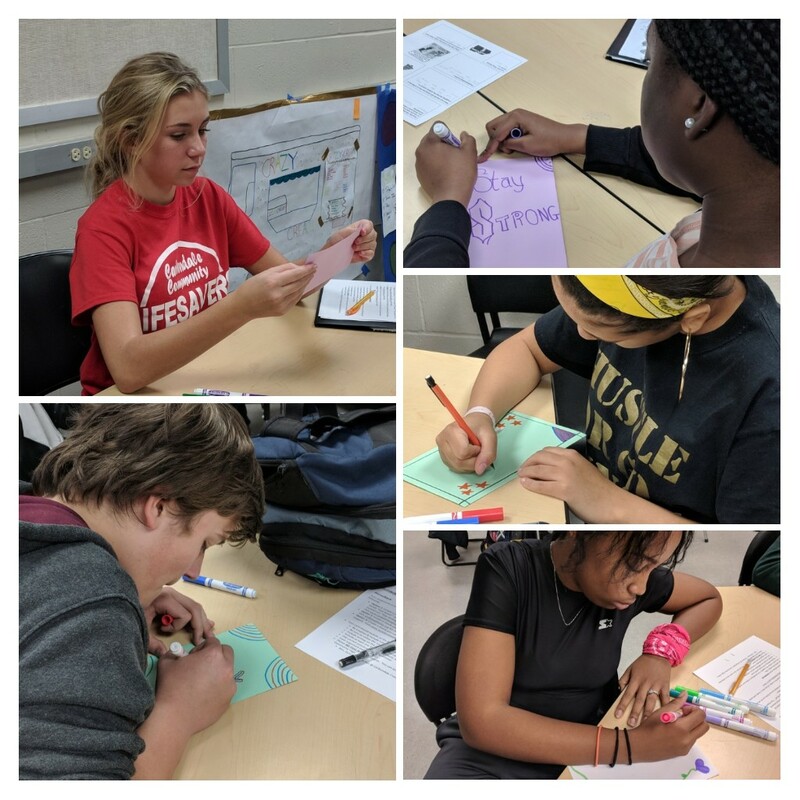 I bring in cookies for my students and we create cards together for senior citizens, terminally ill children, and military personnel. It’s an amazing and fun time. The students get creative, write thoughtful notes, and draw very meaningful pictures to raise the spirit of others. In October, I turned 31 which meant it was time to embark on a new year of random acts of kindness. This is my 4th year to dedicate my birthday to giving back and spreading kindness into the world. 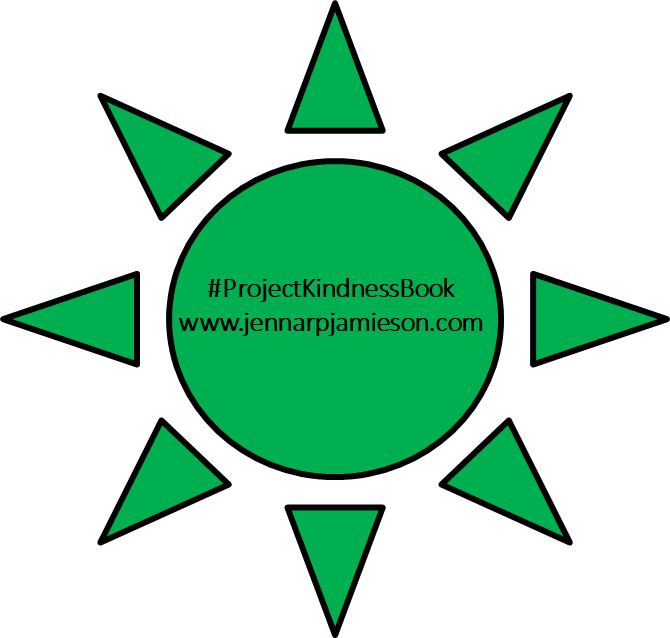 It means that I will do a minimum of 31 random acts of kindness this year. The more you do it the easier it becomes and you realize how much you love it. You will probably end up doing far more than your minimum once you start. I challenge you this #GivingTuesday to use your birthday to give back. Get your workplace to create cards to send, bake cookies for nursing home staff, or give a gift card to a random stranger by placing it under their windshield! Life’s too short not to spread more kindness! It’s been a busy few months for some really great things at the school where I teach and the community I live in. There may appear to be a lot of division, chaos, stress, negativity, sad stories, awful news, maybe even hate in the world, but what I have found is there is a ctually even more positive stories where people are doing great things. Here are a few examples of some awesome community kindness stories: David Muir shared a story about a community in Milwaukee where a bus driver helped a homeless person in need who was on her bus. I also saw a story where a community is rebuilding a school and students and teachers served Thanksgiving dinner in Panama City, Florida where there community suffered extreme devastation due to Hurricane Michael. It’s our responsibility to spotlight amazing stories and make those the focal point today and every single day of the year. That’s what will help make the world a better place and I think that’s something we can all agree we want and hope to see for the youth in America. 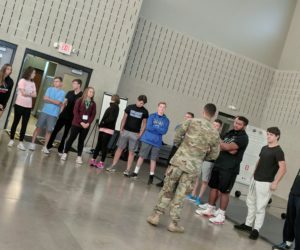 I recently reached out to the local Army National Guard to assist with team building for an entrepreneurship and leadership program. What I got from involving the Army National Guard was awesome! 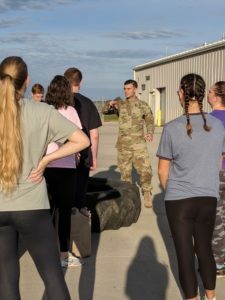 I teamed up with a recruiter who has helped with team building, boosting self-confidence, and demonstrating how to use the skills of each member on your team to accomplish goals. Summer has officially been over for a month and it has taken me this long to sit down and write about someone that touched my heart when I was volunteering one evening in August. I was volunteering at my alma mater because I love to help welcome the students back to campus. It was a casual evening where I helped give directions to students, greet students, and welcome them during a “Back to Campus” event. It was simple and easy to do. I didn’t feel like I had done much other than say hi and welcome back to students. As I was walking around at the very end of the night I came upon a student that was walking home after the event. I walked by as I was browsing my phone and then circled back because there was something about the student that concerned me. He had a physical handicap that made walking very difficult. He was also staring at his phone with a confused look upon his face as if he needed something. I could tell he was struggling so I asked if he needed help. He said, “I am trying to figure out what direction to go to get back to the dorms.” I explained the location of the dorms, but also wanted to make sure he could get to a bus because walking was very difficult for him. It made me realize how much I take walking for granted. He seemed very grateful for the help. I actually wasn’t sure if the buses were running on their normal bus schedule so I went to verify it with campus staff to be sure he was able to get to where he needed to go. He got the directions he needed to get to the bus stop and that was something that made me realize how important it is to offer help. I came across this young student at just the right time to assist him with getting back to the dorms safely. Not only did he remind me of the importance of helping others and being present rather than browsing on my phone, but he also forced me to think about how much I take my legs and feet for granted. That student had a permanent handicap that prevented him from walking at a steady pace or maintaining quality balance. It’s something that many of us take for granted on a daily, weekly, monthly, and yearly basis. Next time you see someone who may need help, may be handicapped, or may need guidance I implore you to do the right thing. It’s too easy to look down, look at your phone, stare, or just simply not want to get involved with others, but that’s not the right thing to do. We are meant to be kind and help other people. There’s a reason why we should be kind – that reason is often to help someone else, inspire someone else, or make the lives of those around us better. After all, you will find more purpose and meaning when you give back and help others than you will in any other facet of your life. This is a perfect subject as we begin another new school year. It is a great topic to discuss and bring awareness to how we can all be a little less judge-y about others. I’ve been taking several college classes over the last four to five years in different fields and for different reasons, but mainly because I love learning. There were a few classes I was dreading, but not because I was worried about the work. Remember, I love learning and part of learning is doing assignments and activities that broaden our experiences. I was dreading it because I was worried about the professor. I had encountered this particular professor at a local organizational meeting that I attended one evening and she seemed to be very rigid, almost grumpy. She wasn’t overly friendly or bubbly, in fact, she wasn’t really friendly at all. I knew she taught two of the classes I was interested in, so I would have her as a professor and that really worried me. This is when the story changes just a bit. I took the plunge and signed up for those classes. I decided it was time to face the worry that I was feeling and get through those classes that I wanted to take. This is the part where you learn that I had completely prejudged that professor. She was a phenomenal professor that had the class organized very efficiently. After taking her two classes, I realized how pathetic it was that I even considered letting my initial judgment of her impact taking those classes. She could have had a difficult day when I met her that evening, she could have been facing a battle I knew nothing about, or she might just have a personality that is different than what I thought it should be as a professor. She isn’t required to be bubbly or overly friendly and I can assure you that her teaching style is drastically different from her everyday personality. She may not like going to meetings or she may feel awkward in social situations. Whatever it was, it didn’t even matter. It wasn’t important. And it was a wonderful learning lesson for me. I was reminded that my judge-y self needed to take a step back and realize that each person’s personality is unique and should not be judged. Not now, not ever. Making ‘thank you’ your regular reality. The last week of school I wanted my students to be extremely comfortable with the concepts and topics that we had covered over the 18 week semester. Further, it was important to me that the students could look beyond the test and the multiple choice questions. I really hoped that they could apply the information on taxes, checking and savings accounts, and renting an apartment after graduating high school. Midway through the week, I had a rather shy student come up to me and in the most genuine voice say, “Thank you so much for reviewing with us this week, Mrs. Jamieson. I really appreciate all the time you have spent to do this.” It was a simple gesture, but meant a lot that he chose to say that. A simple thank you really is as easy as that! My first year of teaching at my current school I felt like I was flying by the seat of my pants during parts of the semester. I started in the middle of the year and had very little prep time to get a classroom ready and activities prepared for class. 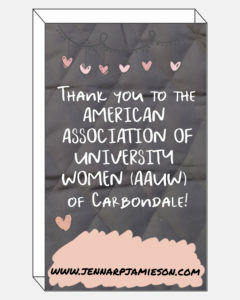 I remember toward the end of the semester receiving a card in my mailbox. I opened that card to find a thank you note written from one of my students. He was thanking me for being his teacher. He wanted me to know that he thought I was doing a great job. It meant a lot to me to receive that note. I felt so lucky to have such a genuinely kind and appreciative student. And, to this day, I still have that note. While those thank yous really inspire me and give new perspective, sending and giving thank yous is what really makes my heart happy. I love seeing others when they feel appreciated or surprised by a gesture of kindness. I recently went to a conference that had a small team that worked extremely hard to plan meaningful sessions. I could tell they worked long hours and had planned for months upon months. I sent a personal thank you card to each person on that team to show my genuine appreciation for the work they had done. So often we attend large events, galas, conferences, or fundraisers that caused a group (often small) to work their butts off to make it a phenomenal time for others. It is usually nice for someone to acknowledge their work and the time they spent to execute it. Recently, I had a friend who was getting ready to leave the school I am at to start a new adventure. We were not close friends, in fact, I only knew him on a small level. Before he went back to his city life, I wanted him to know how much I appreciated meeting him and having him as an aide for the very short time that we worked together. He was delightfully surprised by the thank you, which is one of the best ways to thank someone! Lastly, I chose to take bagels and cream cheese from Panera to an office where I do a very small amount of contractual work. It’s a small group of very hard working individuals who are very kind and friendly toward me. I randomly thought it would be fun to surprise them to let them know that I see how hard they work each day. I got there with the bagels in hand and they were thrilled. The director came to me and said, “We have never had someone do something like that for us.” So, next time you have the chance to do something small, or to do something big, just do something to show appreciation and to thank others. I hope these stories inspire you, motivate you, and cause you to surprise others with cards, food, or other ways that show appreciation for what they do. Let’s make sure that thank you is a always a reality. It will change your day by making the day of those around you better! Life is just a ride…you must keep pedaling! I also did some volunteering this month because it’s kind of my hobby. A hobby that I allow to take over my ‘normal’ life on occasion. I volunteered at SIU’s graduation for probably my 10th time or more. It was a simple gesture to help others out and give back to my community. It’s important to recognize the impact volunteering can have in your local community. With all the ways to make a difference, to give back to organizations, and to help others in need, volunteering can be one of the most simple ways to do that. Not only does it help your community and people in it, but beyond that it gives you a sense of purpose. That is at the core of finding and achieving pure happiness – finding genuine purpose that can give your life meaning. I challenge you to add more volunteering to your life where you get nothing in return, not something you do at your job or at your church, or as part of a club you are in, but pure volunteering with no sub-lining or sub-benefit. Volunteering where you give your time away for free and get nothing in return. It will give you purpose – specifically, a purpose you have probably never felt before. Giving love and support to those that need it most! I have had an extremely tough semester for a multitude of reasons, but mostly because I have students that truly and desperately need support and guidance. 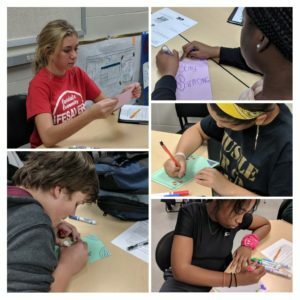 The mixture of high school students I have has made teaching exceptionally difficult and left me grasping for ways to efficiently teach consumer education to a range of students whose learning levels range from elementary to college. The learning differentiation isn’t my only obstacle, though! The students I am teaching have a large range of lifestyles and home environments that impact how they view education, their ability to work outside of school, and how much support they receive at home. This is the reality for so many teachers and I know I am not the exception. Combine my class concerns with some of the school dynamics I have faced including not having a classroom – wheeling around a cart to four different rooms throughout the day to teach has been a chaotic, mountain-climbing adventure. To add to the mountain, I had some students going through some major life struggles which included me assisting with several emotionally and mentally draining situations that has left me feeling unsettled on more than one occasion. Additionally, I teach in some classrooms with computers and in other classrooms with no computers which creates another level of structured chaos when it comes to planning lessons, adding another piece to my puzzle that I have to carefully put together. BUT, there is a silver lining and there actually always is one no matter what the situation is! My students may show a long list of emotions in the classroom because of their diverse backgrounds that range from anger, happiness, sadness, frustration, bitterness, humor, fun, and every emotion in between. Each with a unique personality and style, but many of them with their own baggage, their own insecurities, their own challenges and successes, and most of all their own story. A story that is sometimes broken, sometimes not broken, and sometimes underdeveloped. I sometimes feel an overwhelming amount of chaos when there is a group of such a variety in my hands because it makes for a very stressful semester, but these are the students that need love, guidance, and support the most. I became their teacher for a reason and that’s just the reason. To provide that support, guidance, and nurturing that they so desperately need. While it hasn’t been easy and I won’t even pretend that it has, it has been meaningful to be able to recognize and understand that my role is to nurture, comfort, and give to these students the support, guidance, and appreciation that they so need at such a crucial time in their lives. And, no matter what there is definitely some learning happening…some learning from me, some learning from each other, sometimes the students teaching me, but more than anything some much needed nurturing, guidance, and support. Change the life of cancer patients! It may seem expensive, unrealistic, or even hard to change the life of others without having lots of disposable income. It’s true that some things cost money when it comes to giving back. Buying cookies and sweets for the local police and fire departments costs money, buying surprise cards or gifts for strangers costs a little money (though, not much), but some things cost nothing. Writing a note to a veteran and placing it on their windshield, complimenting a stranger, answering questions for those that are lost, or donating hair to help cancer patients doesn’t really cost anything. I traded places with a woman in the post office recently who was running late to babysit. It didn’t cost me anything but a few minutes of time and it brightened her day more than you might have imagined. A week or so later there was a couple in a metered parking lot who were getting ready to put change in the meter, but couldn’t figure out how much, but I yelled across the lot and said you don’t have to pay on Sundays. They were grateful for the response and it was a simple gesture for me to save them the time and money. This past week I did one more thing that I hold particularly close to my heart. I donated 9 inches of hair to Pantene Beautiful Lengths. 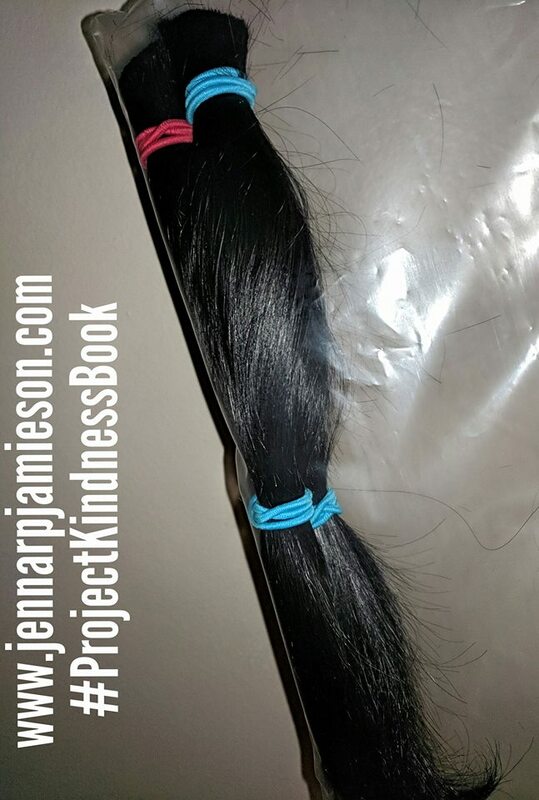 This makes 39 total inches donated so far to help change the lives of total strangers who are battling cancer. Who wouldn’t want to change the life of a cancer patient if they could? It’s simple yet means the world to someone else. I have watched several women I know battle cancer, making it a particular cause that’s important to me. A cause my grandpa would be equally proud of as he watches from heaven, looking down and asking me, “Did you use Pantene Pro-V?” as he used to do as he admired my shiny, black hair. I hope these short stories inspire you to make a difference, big or small, in your community, city, and in the world around you. Go change the life of someone else, specifically a stranger in need of care, support, and kindness. After all, it’s often strangers that are often facing more battles than we often even realize.